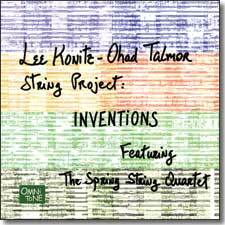 The mellifluous sounds heard on Lee Konitz-Ohad Talmor String Project: Inventions contrast the traditional saxophone-and-brass-based "jazz" sound. Konitz's alto sax and Talmor's arrangments and reedwork interact improvisationally with four accomplished Austrian string players who are also facile improvisers, The Spring String Quartet. Talmor's arrangements take full advantage of the wide variety of timbres possible with string instruments, melding those string sounds with reeds to span a pitch range from lows in the bass clarinet and cello to highs in the clarinet, alto saxophone, and violin. The results make the sextet sound like a "mini-orchestra" of sorts. "The String Project is mostly about collaboration," explains Talmor, "along the lines of the one Miles had with Gil Evans, or of any in which two artists find each other and mutually compliment each other's work and creativity." Recorded in 2004 in Kefermarkt, Austria, at a studio located in a 17th century castle, Inventions was fine tuned through countless concerts, with Konitz and Talmor talking at length about each other's role in the pieces. The result is natural, organically flowing music that is a completely original blend of written and improvised music — both in terms of sounds and colors, but also in how the improvisers react to the sonic surrounding. All compositions by Lee Konitz, Konitz Music (BMI), except as noted. Original arrangements realized by Ohad Talmor. Lee Konitz plays Vandoren reeds and mouthpieces. Buy Inventions now at the OmniTone store.